Webber's first racing attraction was to motorbikes, his father was a local dealer. At the 1999 LeMans 24h Mark's Mercedes aerodynamics caused it to flip on the flat-out Mulsanne Straight. Mark scored points in his F1 debut, in a Minardi thanks to a mass pile-up at the start. 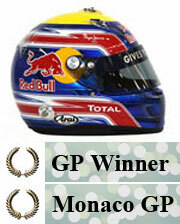 In 2010 Mark entered a team in the new GP3 Series in partnership with Red Bull boss Christian Horner's Arden organisation. Mark retired from professional motorsport at the end of his 2016 Porsche LMP1 campaign in World Endurance Championchip. 2017 Mark was named Officer of the Order of Australia for his service to motorsport and to the community through fundrasing and charity events.